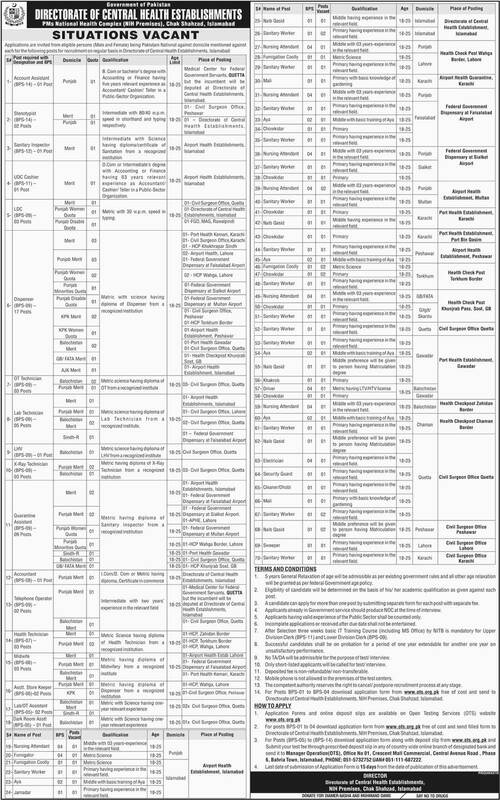 Directorate Of Central Health Establishment Islamabad is announced the Jobs 2019 for the various vacant positions, So they invited the application form from the candidates who are eligible and competent. If you are interested to get the jobs then you must fulfill the application form eligibility Criteria and you must submit the application form within due dates because after the due dates application form will not be entertained. The Directorate Of Central Health Establishment Islamabad career department has assigned the OTS Testing service to collect the application form and conduct the recruitment test from the applicant. So OTS Test Online Registration has been stared and you must register your self for these jobs 2019. Below we provided the complete Eligibility Criteria You can check that and can analyze your self that your are eligible or not. Applications are invited from eligible persons (Male and Female) being Pakistani National against domicile mentioned against each for the following posts for recruitment on regular basis in Directorate of Central Health Establishments Islamabad. Application Forms and online deposit slips are available on Open Testing Services (OTS) website ots.org.pk For posts BPS-01 to 04 download application form from ots.org.pk free of cost and send filled form to Directorate of Central Health Establishments, NIH Premises, Chak Shahzad, Islamabad. Last date of submission of Application Form is 15 days from the date of publication of this advertisement. For Posts (BPS-05) to (BPS-14) download application form along with deposit slip from ots.org.pk and Submit your test fee through prescribed deposit slip in any of country wide online branch of designated bank and send it to Manager Operation(OTS), Office No 01, Crescent Mall Commercial, Central Avenue Road , Phase 6, Bahria Town, Islamabad, PHONE: 051-5732752 UAN# 051-111-687222. 5 years General Relaxation of age will be admissible as per existing government rules and all other age relaxation will be granted as per federal Government age policy. A candidate can apply for more than one post by submitting separate form for each post with separate fee. Applicants already in Government service should produce NOC at the time of interview. Applicants having valid experience of the Public Sector shall be counted only. After Selection three weeks basic IT Training Course (including MS Office) by NITB is mandatory for Upper Division Clerk (BPS-11) and Lower Division Clerk (BPS-09). Successful candidates shall be on probation for a period of one year extendable for another one year on unsatisfactory performance. No TA/DA will be admissible for the purpose of test/ interview. Only short-listed applicants will be called for test/ interview. Deposited fee is non-refundable/ non-transferable. Mobile phone is not allowed in the premises of the test centers. The competent authority reserves the right to cancel/ postpone recruitment process at any stage. For Posts BPS-01 to BPS-04 download application form from ots.org.pk free of cost and send to Directorate of Central Health Establishments, NIH Premises, Chak Shahzad, Islamabad.